Fat baby thighs? Eeehehe. I will be eating something that feels like fat baby thighs. Oh the insanity! I don’t even like cinnamon rolls and these look delicious. Now I must think of an excuse to make them. Curse yoouuu!! My MIL is coming this weekend. She is the queen of cinnamonrolls. Do you think it might be rude to upstage her with these suckers? I don’t care, I might just do it anyway……. Holy cow. You’ve definitely got my mouth watering. I can’t wait to try these. Yum! Man alive, I just tried to make out with the computer screen to get a small taste of that deliciousness. It didn’t work. In my version of heaven, cinnamon rolls are what’s for breakfast every single day. Squee!!! I can hardly wait to try them! YUM! Since I am up here in Canada, today was thanksgiving so no thanks to the buns for today. But the recipe looks yummy! Nice to meet you Dandelion Momma, I am Hollie, writer of cheaperthencheap, it is my newest attenpt at blogging. I am a solo LDS parent of one child, she has Aspergers, I write from Toronto. This is my favorite way to acquire awesome recipes. From real people in my life who are really really happy with the recipe they are sharing. It’s gonna rock, I just have to come up with an occasion to try them! Whoa. Those sound impressive. Dietetically sinful. …Sinabon? I’m making them today. It’s as if some unknown force is pushing me to the grocery store, willing me to buy what is needed so that I can make them right now…. this very second. I can hardly wait!! Now when I see Little Sister’s fat baby thighs, I’m thinking of cinnamon rolls. Hmm..guess I’ll have to break down and make these suckers. And suddenly… all was right with the world. OK, just finished them. I have a coupla questions. 1 – How many is this recipe supposed to make? Mine ended up at 18, and easily could have been twenty, if I didn’t reject the end pieces. 2-Can you seriously fit 8 of these in a Pyrex? I could only do 4, maayyyyybe 5. Mine were seriously HUGE. I just wonder if I did something wrong to make them too big or something (not that anyone here’s complaining. I actually heard my kid ask for HALF a cinnamon roll. That never happens). Maybe I didn’t roll it out thin enough or I let them rise too long? Unsure. Please diagnose without having seen them, tasted them, or even technically, having met me. That’s not too hard, right? They are divine! The icing will kill you, but man oh man, will you die happy. That icing is going on a number of cakes and such from now on. Really happy that you liked them as much as we do. For us, this is the Be All and End All of cinnamon rolls. NO other recipes need apply. 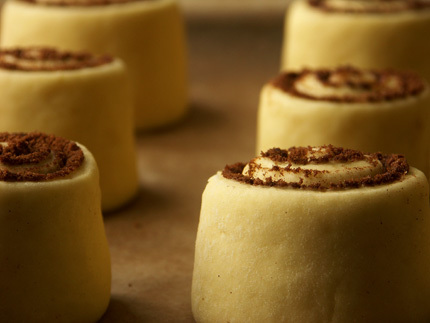 Pingback: Tracy’s Cinnamon Rolls « Julie Cooks! I keep a recipe blog (http://hotnsteamy.wordpress.com) and would love to put your cinnamon rolls on my site… is that okay? HI Shanelle- that’s just fine, as long as you give me credit! Thanks! Silly Goose! That’s not at what I meant! But by all means, go ahead and use them. I look forward to reading some of your fantastic recipes. WOWOW i really love this buns, thank you for give this recepie. but what i am not sure is that if the oven needs to be preheat or not …i am not sure to do them because i love to bake but all the time something goes wrong and this time i would like to do them without any mistake. thank you so much. Preheat the oven. Good luck! Ok… Maybe a dumb question. What cream do I put in the icing? Whipping? Heavy? Half ‘n’ half? Makin ’em tmrw for conference… 🙂 can’t wait!! Jen, it really doesn’t matter- cream, half and half or even milk in a pinch will work. Good luck! Hey, everytime i mkae cinnamon rolls they come out not that good, they get burnt from the bottom and still doughy in the middle … but i just love cinnamon rolls and i want to make them really tasety almost like cinnabons … so i wanna ask u if this recipie is really worth it or not? And does get cooked from inside?? plz answer truthly … Thank you!! george, this recipe is awesome. They are still goey inside, but that is part of why they are so fantastic. This picture of the rolls is not its real pic. I found the same picture on the internet .. so i need a real picture of them to deide! Sorry George- it is a stock photo, and you can make them or not- but if you click on some of the links above, you can see real pictures. If you opt not to make them, it’s really just your loss- they rock. Good luck in your search for the perfect cinnamon roll. They’re bigger and more gorgeous than the picture, once baked. Good luck, George. Santa brought me a new Kitchen Aid Mixer for Christmas and I am so going to make these! YUM! Wowowow… thanks to George for bumping this up to the top of the comments. I must have blipped out when you originally posted this recipe. It looks fabulous. I only let my hubby make his cinnamon rolls for me on Mother’s Day. It’s been our tradition for the last five years. But, I may have to amend this rule to allow him to make me THESE cinnamon rolls as they are not his recipe. You know, for scientific purposes only. Jen, I got a new Kitchen Aid too! When you said 2 packages of dry yeast, how many ounces is that??? Figure 2 Tablespoons if you are using bulk yeast. My first time ever making cinnamon rolls and they came out perfect! Thank you for this awesome recipe. My son said they tasted better than Cinnabon. How flattering is that?! I made one change to the recipe and used bread flour. Today was a test run for Christmas, which I have been assigned to contribute to the family Christmas breakfast. It was a lot of work, but well worth it. I will attest to the greatness of these cinnamon rolls. Georgie made these before and we loved them.This year, she made some with raisins, as her grandmother and I love raisins in ours, some with pecans, and some all by themselves. But this time, I believe they were even better than before. She made them a little smaller. Which was a good excuse to have more than one, when you have to ‘sample’. We’ve been drooling since eating them. We started Christmas morning with these prior to opening presents, to hold us off until Christmas Brunch. Georgie, I’m so glad you liked them! They really are the be-all and end-all of cinnamon rolls. After this recipe, you never need another! Hello, one other question, this time regarding the pudding. It might sound weird, but in Romania we don’t have instant vanilla pudding, or maybe we have it under another name. So i don’t know what to use, or how the instant one you’re using is like. The pudding mixes we have here are done stove top, with boiling milk, sugar and the actual mix. I’m guessing it’s not what you use. And I don’t think you use the ones that look like whipped cream after you’re done mixing them either. One other thing i was considering using is called Creme Ole from the Dr. Oetker brand which is indeed done with cold milk, not water like you used (i guess you can replace the milk with water though) and by actually mixing it for 3 minutes with the electric mixer. Does this sound close to what you are using? Please give me more details on this instant pudding thing, I’m really hoping to find a substitution for it. Go ahead and use the Dr Oetker with the cold milk- it will work just fine. Thank you, Tracy, and good luck with everything you’re going through! I know I’m late to the party here, but a friend just posted this link and I’m chomping at the bit to try them. I want them for Conference morning (tomorrow), but I’m wondering what I can prep the night before so that I don’t have to wake up at 3am. You can make the whole shebang the night before, leave ’em in the fridge, and then bake them in the morning, if you want. Or, you can just make the dough, and roll them out when you’re ready. They really are the BEST. Hope you like them! One question if you make them the night before and bake them in the morning do they have be stored covered for the night? So, in reality, I could make these for dinner!! I’ve never used YEAST in my life…can I manage this??!! I am determined to make these TOMORROW! I can’t believe you just advertised online that you will have freshly baked cinnamin rolls at your place this weekend. Sounds like you just put yourself in danger of being robbed. By a female. About my height. And hair color. Only looking for one thing. And you have a freshly baked big pyrex pan of them. Just sayin. Your safety is on the line here. LOL! “it will feel like fat baby thighs”. best. recipe quote. ever!!! Jami, I would try some sort of custard. The egg-y, creamy goodness of the pudding is what you want- and I know in England a pudding is a completely different thing than in the states. I imagine a slightly thin custard would work. Best of luck! HI Matt- I have always just used what I have on hand- which usually means unsalted butter and all-purpose flour. They really are spectacular. I hope you like them. # 1. We have a pudding mix in our country that calls for 2 cups milk to be boiled with one sachet..should i use 1 cup intsead for the sachet or 1 cup for have sachet..the casturd thing calls for 2 TB sp. For 1 cup milk what should i use or make. # 2. can i divide the recipe to have less buns ? # 3. Using the butter in room temp. Or cold. # 4. In the cinnabon store they pick the dough from refregirator and roll it …i guess that makes it stands in shape..my old recipe got the same taste but the shape flattens ( it calls for 2 tsp. Yeast for 3.5 cups flour ) and it was like the pizza dough ,what to do to make it keep this nice standing shape like cinnabons ? I’m not sure about the pudding. You can divide in half, yes. Letting the dough sit in the fridge overnight helps in taste and texture. oh and when i roll it after getting it out of fridge..should i leave it to rise for 2 hrs or bake it immediately ?? I just use Jell-O vanilla pudding, but an will work, even one you make at home, honestly. If you’ve rolled them out and let them rise in the fridge overnight, if they are sufficiently risen, go ahead and pop them in the oven. If they need to rise more, bring them to room temp on the counter. So disappointed in this recipe….. Wish I didn’t loose my last one it was way better, I used frozen bread dough, less butter, less sugar and it tased like the REAL Cinnabons…. 6 hours after THIS DISASTER I can’t even give them away, they went straight to the garbage. Sorry Amanda- I wonder what went wrong- I’ve never had them be anything but spectacular. I hope you find the recipe you liked better. Best of luck. A tip that i remembered, of course after baking this time, when you roll you dough out and put the butter down you NEED to add flour on top before adding the brown sugar and cinnamon or else, like what happened to mine all the yummy goodness melts outs. Hmm. Well, I never have had to do that, but I know humidity can really effect baking results, so perhaps that’s a difference. I’m glad you have a recipe you like better. Cheers! These are THE BEST! I don’t know how anyone could think otherwise! I just wanted to thank you! My friends think I should open a bakery after trying these yummy buns! Thanks so much..